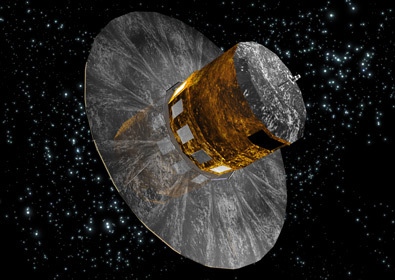 Objectives: To create an extremely accurate 3D map of around one billion stars. To carry out spectroscopic observations of around 150 million stars. The Gaia satellite is a European Space Agency (ESA) cornerstone project, aimed at the understanding of how our Milky Way galaxy was formed and how it has evolved into what it is today. Gaia was selected by ESA in 2001 and launched on 19 December 2013. It has been designed to measure with extreme accuracy positions and fluxes of approximately one billion stars on the sky over a period of five to six years. Spectra will also be taken of at least 100 million stars. From the variation with time in the stellar positions, combined with the flux measurements, astronomers can derive some of the most fundamental properties of stars, such as their distances, luminosities and velocities in space. Building Gaia has been the responsibility of an industrial consortium led by EADS Astrium in Toulouse, with two major UK partners, Astrium Stevenage (on-board data processing and micropropulsion system) and e2V (CCDs (charge-coupled devices)). The Mullard Space Science Laboratory of University College London has had a major role in the development of the spectrometer and calibration of the CCDs and their electronics. The on-ground processing of the science data is the responsibility of the scientific community, organized in the Gaia Data Processing and Analysis Consortium, DPAC. The UK is a major partner in DPAC, responsible for the processing of the photometric data (Cambridge data processing centre for Gaia) and the preparation of software for the spectroscopic data processing. These activities, which involve institutes at the Universities of Cambridge, the Mullard Space Science Laboratory, Edinburgh, Leicester, as well as the Rutherford Appleton Laboratory and the Open University), are supported financially by grants from the UK Space Agency and the Science and Technology Facilities Council (STFC). The mission is planned to operate for at least five years. Gaia will generate a vast amount of data, which it will be sending daily to one of the three ground stations: Cebreros in Spain, New Norcia in Australia or Malargüe in Argentina. The Gaia Mission Operations Centre (MOC) will be located at ESOC, Darmstadt, Germany. The Gaia Science Operations Centre (SOC) will be based at the European Space Astronomy Centre (ESAC), in Villafranca, Spain, where the initial data processing will take place. Further data processing will be shared by five data processing centres. One of these centres is the Cambridge Data Processing Centre. Download the script of the vodcast. Download "Episode 6: Charting the Galaxy - from Hipparcos to Gaia" from ESA's website. Find out how we measure parallaxes and why we need satellites for accurate parallax measurements. An in-depth information about the mission - its operations, spacecraft and science - can be found in Gaia section of ESA's Science & Technology portal. Information about Gaia for astronomers is available from Gaia section of ESA's Science website. A detailed description of Gaia's scientific targets can be found at ESA's website at http://www.cosmos.esa.int/web/gaia/science-performance. Download "Gaia - ESA's Galactic Census" brochure (PDF, 3.36 MB).